As a former private school/Catholic school girl, plaid and are I are super close. There is something about plaid that is seen as completely preppy, which by all means many times it is. My strict uniform at times included a red horrible pleated plaid SKORT (yes a skirt plus shorts equaling a skort), along with a white blouse button up, knee high socks, and penny loafers. In 7th grade it was really cool to put the penny in the loafer. As you can imagine, I was like totally the coolest gal in school. After many years of cringing, I am over my plaid fear and embrace it fully when it comes in the perfect size, amount, material, accessory, etc. A perfect go-to for clutches, the Lauren Merkin Plaid Silk Louise Clutch features shantung-silk along with a perfect summer hue mixture on the Madras plaid print. 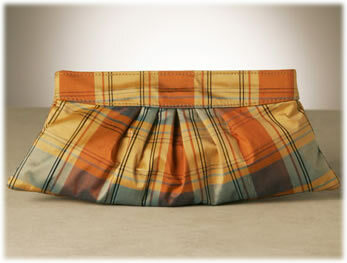 There is subdued pleating at the front and back clutch with pleating at front and funky metallic striped lining. Dimensions are 6.5″H x 14″L. Far from reminding me of a uniform I once wore, this clutch is pretty-cute for summer. Via Shop Bop for $180.